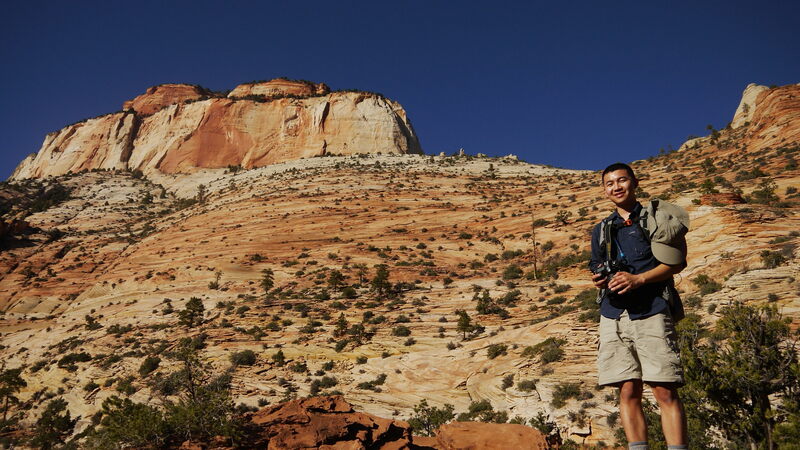 Back in July, I was selected as one of the lucky lottery recipients with a day hike pass to the Wave, in Arizona. For more details of how I applied for the lottery, see old post HERE. On the last weekend of October, the trip to The Wave finally came. Since our day hike for The Wave was on Sunday, we decided to string on a couple stops to make the weekend trip more memorable. 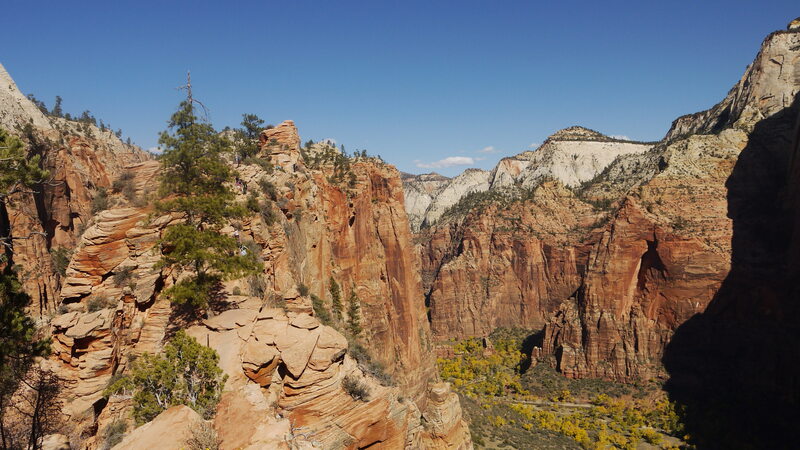 First stop was an old favorite, Zion National Park to hike the famous Angel’s Landing. We arrived in Hurricane, Utah a little after midnight, traffic coming from LA towards Las Vegas after work on a Friday night was horrendous, the drive out of California took longer than we anticipated. Early next morning, we hopped into our car towards Zion National Park. The drive from Hurricane to the main park entrance takes about 30 minutes. 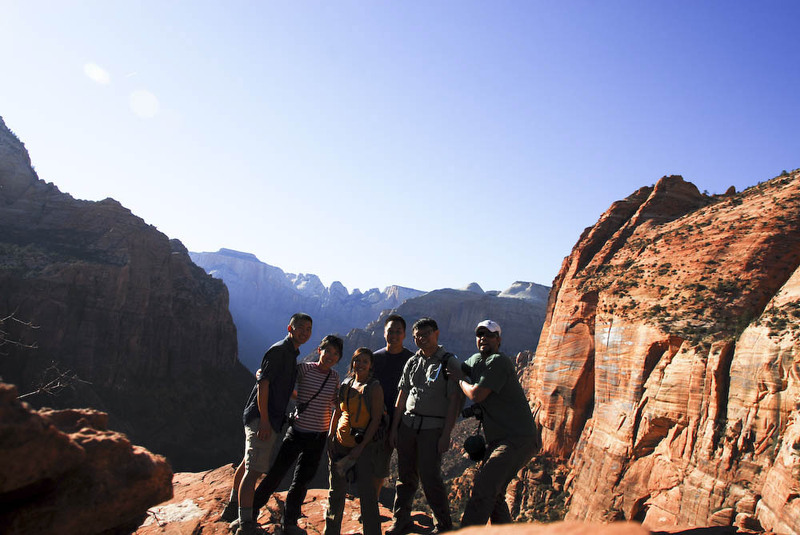 This was our third time visiting Zion, each time during a different season. 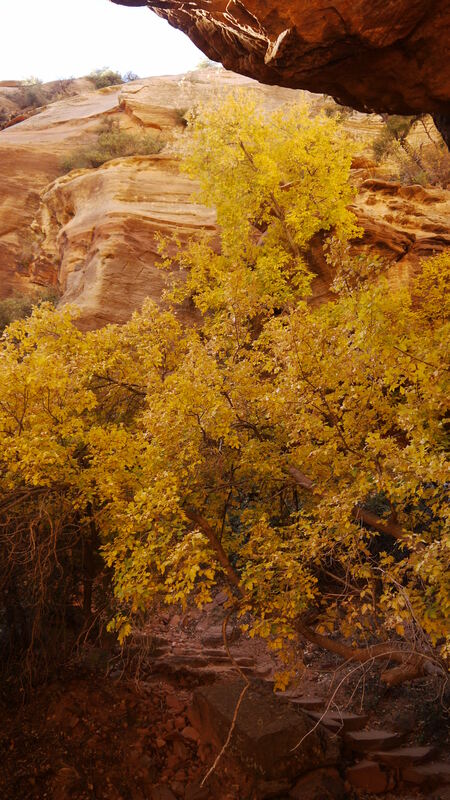 This time, the fall foliage around the red rocks gave us yet another beautiful perspective of the park. The day was perfect, sunny, in the low 70s, I could feel my work week stress quickly melting away. We parked our cars at the visitor center and hopped on to the park shuttle, turns out this was the last week the shuttle will run before winter season hits. 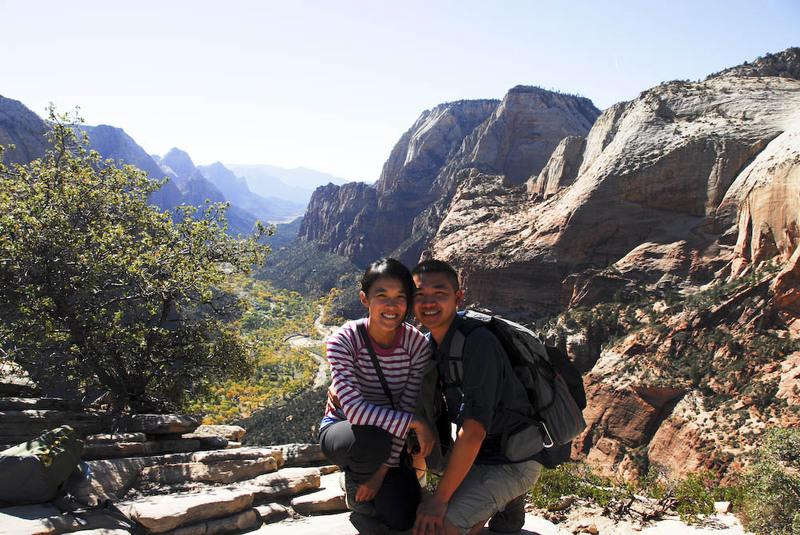 To get to Angel’s Landing’s entrance, we got off at the shuttle at The Grotto stop. The round trip distance of this hike is about 5 miles, but don’t be fooled, it’s a steep incline to the top. 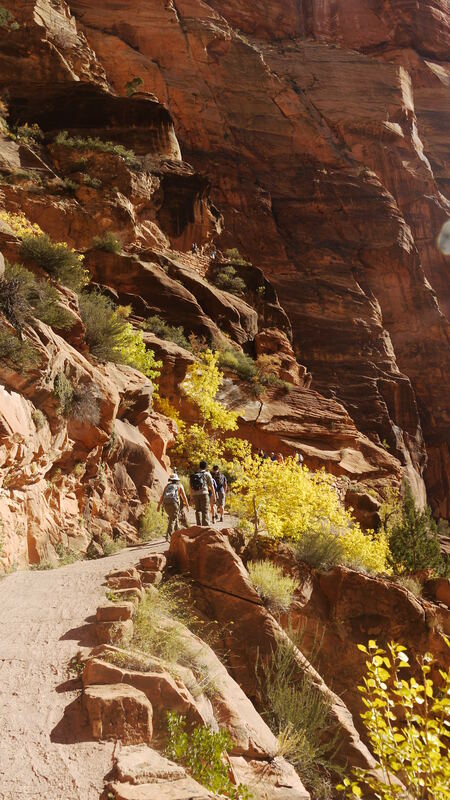 On a hot day, plenty of water is needed since much of the trail is exposed to direct sunlight. 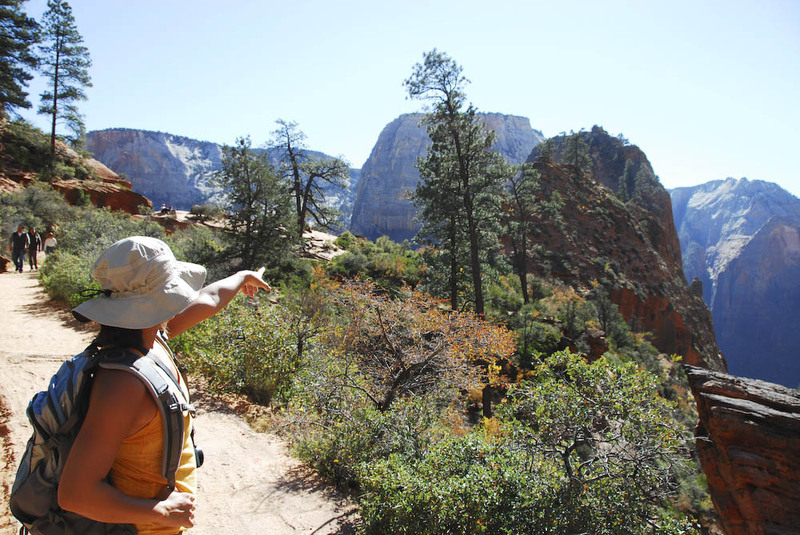 Start of the Angel’s Landing trail, Lisa pointing towards our final destination. 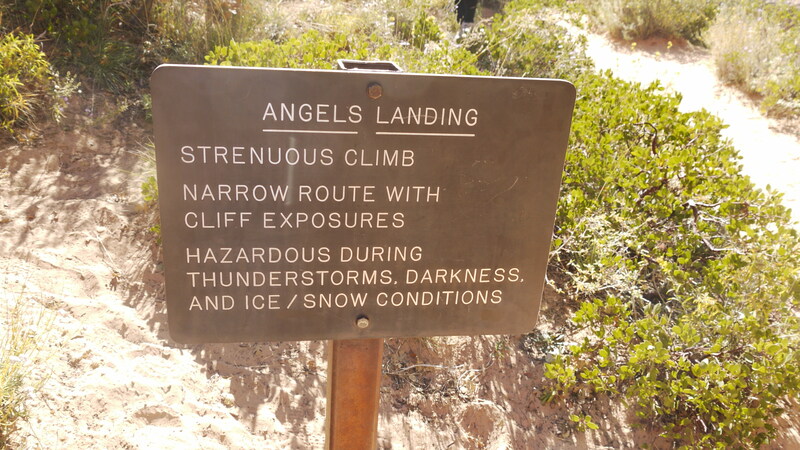 One last warning before ascending the last portion of the trail. The well maintained trail disappears at the last half mile of the hike and this is where the hike gets a little tricky. A hand rail is needed to maneuver up to the top. 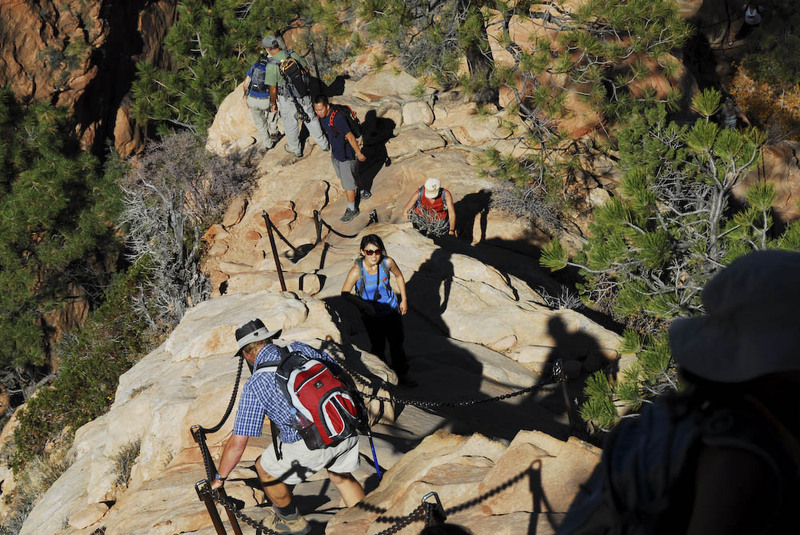 Make sure to hang on tight because on portions of the hike there are steep drop offs on both sides of the trail! Although I was never worried for my safety on this hike, I would definitely not recommend this hike for people who are afraid of heights. Louis taking a shot of us waiting for a hiker coming down from Angel’s Landing. View from the top, we were treated with a magnificent view of the Zion valley. 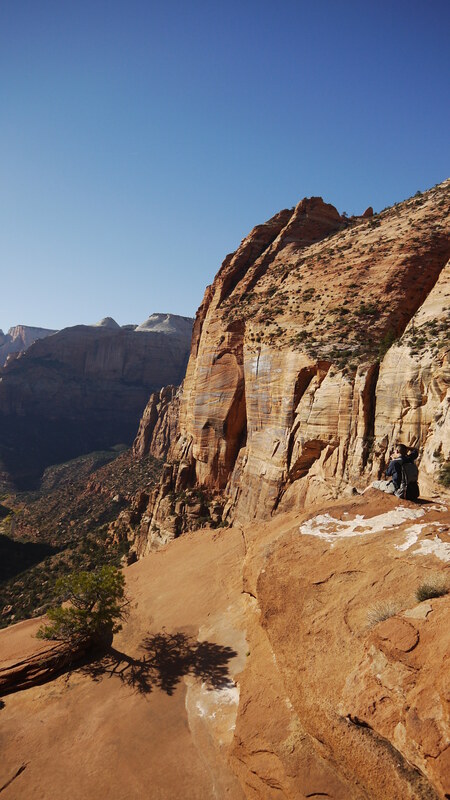 After Angels Landing, we drove to the east side of the park and hiked the Canyon Overlook Trail. 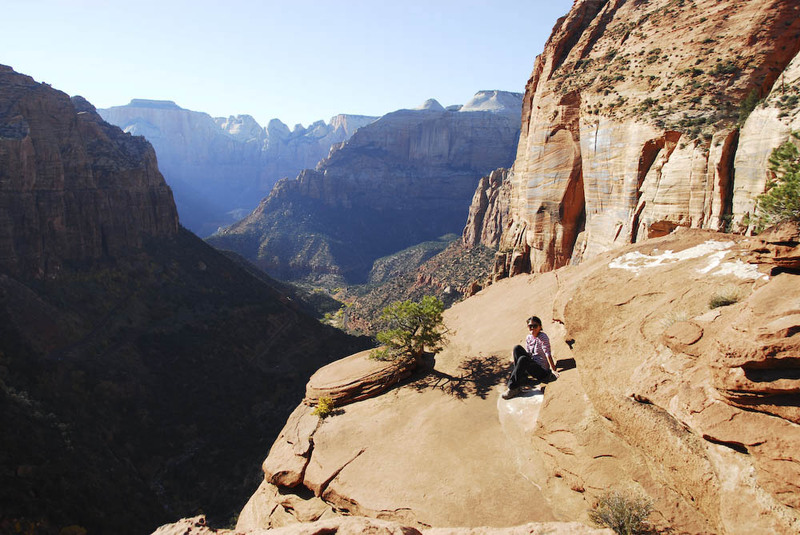 This was a short time that awarded us with a beautiful look out of the entire canyon. The parking lot for this hiking trail is right after the tunnel, be sure to slow down to find the parking lot. Start of the trail Sam over estimated her fearlessness of heights and decided to have Louis take a quick photo before she scrambled back to safety. Group photo before leaving the park for some excellent bumble berrry pie in town! 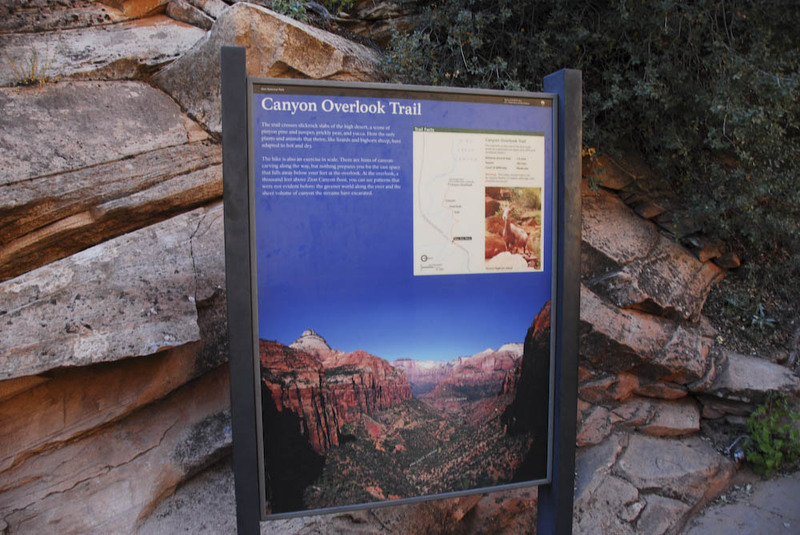 This entry was posted in Hiking & Backpacking, Trail Reports, Travels and tagged getoutside, Hiking, national parks, outdoors, trail reports, traveling, utah, Zion National Park by hikenoworklater. Bookmark the permalink.